Now you don't need to be rough with your crowning glory in the mornings. 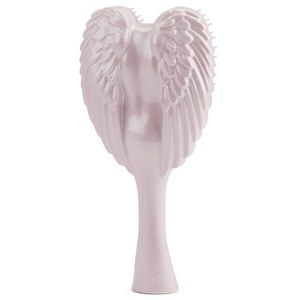 The Tangle Angel Brush - Pink actively combats knotted or tangled hair leaving it feeling smooth and manageable. We all love the shower-fresh feel of clean hair and the anti-bacterial properties of the Angel brush will ensure your hair stays in pristine condition after brushing. It is anti-static, heat resistant and can function as a blow drying brush for any hair type. It's a hair lifesaver, but the Tangle Angel Brush also looks the part. The design includes two pearlescent wings, which can be held to increase your grip, and a pretty two-tone finish.